Watching Durham Bulls Baseball: 7th Inning, Again? What is it about the 7th inning? Déjà vu. And not as if it should have been unexpected. Enny Romero has only gone past 6 innings once this year, back on 1 June. Going into the 7th his pitch count was low at 79 pitches, so that must have been why he went out to face famous home run hitter Mike Hessman. Bad decision. Hessman hit a home run. Two more hits and one more run later the Bulls were three runs behind and had even less of a prayer of winning than before. Because the Bulls simply have not been hitting lately, as yesterday’s chart showed. Last night Toledo’s pitchers tied them in knots. Only 5 hits, all singles, a walk, and a hit batsman. That’s just seven base runners. Plus the one time they did get a runner to second base (Mike Fontenot in the 4th), he was thrown out trying to steal third base. And the Mud Hens were able to pull off three double plays, which did away with three of those guys who got as far as first. 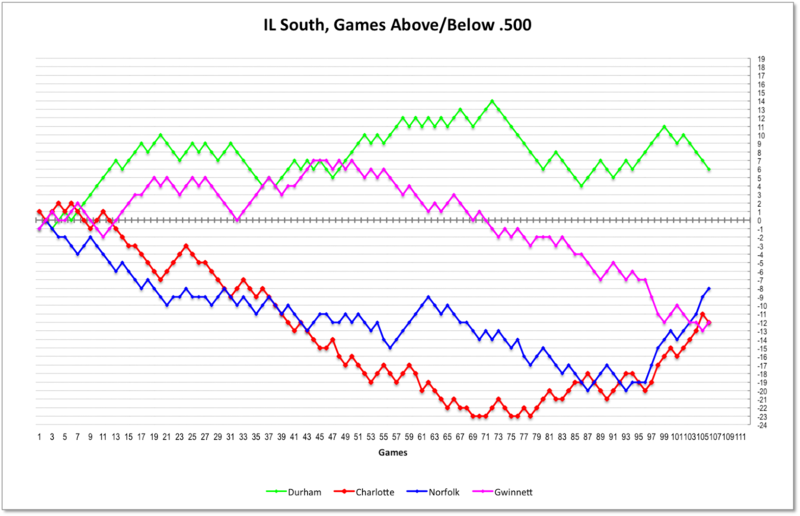 The Norfolk Tides have won six in a row and are coming on strong as the Gwinnett Braves fall off the edge of the cliff (see chart below and the standings) The Bulls’ lead in the South Division of the IL looks much less comfortable. Juan Carlos Oviedo is a Tampa Bay Rays relief pitcher who started the season with the Durham Bulls. Technically he was on a rehab assignment and never counted against the roster. He made 7 appearances for the Bulls, pitching one inning in each appearance. [ Bulls stats] A short reliever for the Rays, he made 32 appearances for 31.2 innings down there. Stats. I mention him because he has been designated for assignment by the Rays. That means that he could show up in Durham. The Bulls are short one man and the Rays did not send Jeff Beliveau back. Could be Beliveau is going to stay for a while. Dan Johnson’s still up with the Blue Jays and “blasted” a 70-foot infield hit for a go-ahead RBI. He followed that with a 3-run, 9th inning homer to win a game against the Yankees.